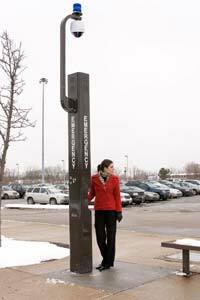 The Wide-Area Emergency Broadcast System (W.E.B.S) by Talk-A-Phone integrates the company's emergency/information phone and wide-area broadcast capabilities into a single attractive emergency/information communication system, ideal for large campuses, open space programs, mass transit, and light rail applications. The W.E.B.S tower features concealed high-powered speakers that provide 360 degree coverage for both locally and remotely transmitted broadcasts. With the system's Zone Paging System, officials can broadcast remotely via an attendant phone and also have the option of broadcasting to towers individually, in selected groups, or all at once. The tower's phone line powered emergency/information phone automatically activates the attention getting blue light/strobe mounted atop the tower whenever an emergency call is placed and quickly connects users to emergency/information assistance. The W.E.B.S tower stands 10 feet 2 inches tall, weighs 435 pounds, and can be customized to feature CCTV and a variety of lettering and signage.